JungleWatch: BATTLE OF THE BISHOPS? Is this a game? Will Archbishop Hon capitulate to the Neocatechumenals? The NCW is a sad cult. They will do anything to justify their agenda. Take the people for all they have and use the cloth to hide their lies and deceits. What a mess this has become. 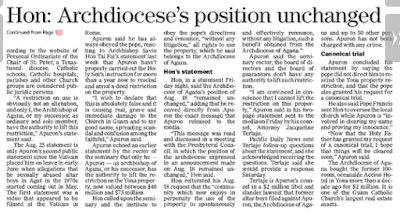 Apuron is spreading malicious untruths against Archbishop Hon as he did to Archbishop Balvo. It will not belong before this is reported in media blogs. 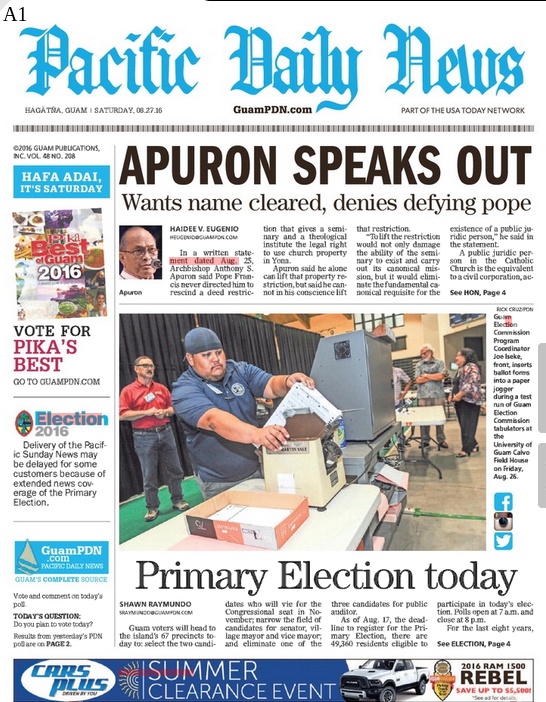 Suspect Apuron will lead Guam into much deeper moral decay and a church that becomes Bankrupt. Yes folks the church of Guam needs to go Bankrupt before we realize the evil of Apuron. Time to Bring Apuron to his Knees. To show the church of Guam he is a fake catholic bishop and immoral in all his actions. Time to denounce him. Lyin fake bishop. Face of evil satanic face. Apuron says this is causing damage to his good name? ROTFLMAO!! Really funny in light of what he did to Gofigan and Benavente and especially the Lastimoza family. Apuron denied only the RMS issue but NOT the molestation of children issue. Why? Because he truly molested those boys! I don't have not even a speck of respect for you apuron. Get out of this island. Apuron destroyed countless people in 30 years. Now he complains his good name is being damaged. What good name? A child Molester, a Common Thief. 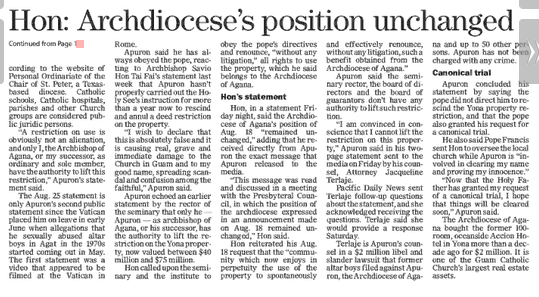 Apuron your name is so disgraced you are no longer respected as an Archbishop. What are you talking about? You nutcase. He just ruined his family name "apuron" and do believed some of his owned family dislike him for taking their properties that were rightfully part theirs. Now he must be now learning to sing new song like "Only the Lonely".